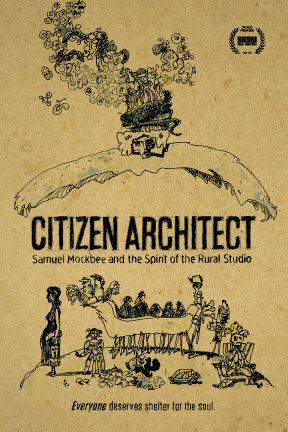 Next Tuesday November 26, at 7 pm, V I L L A G E R S in West Asheville will be screening the documentary Citizen Architect: Samuel Mockbee and the Spirit of Rural Studio. I highly recommend this film. I first watched it after meeting the director/producer, Sam Wainwright Douglas, at the Doo-Nanny a few years back. Citizen Architect touched me deeply. Sam Mockbee was a compassionate visionary who left behind a very positive legacy. He questioned the way architecture is taught and forged his own path as a teacher by leading his students in creating beautiful spaces for people who lacked financial means. The work he did was incredibly inspiring, and it is being carried on by his former students to this day. Watch the trailer below to find out more about this story – if you can’t make the screening, maybe you’ll be inspired to get the DVD and share it with your friends. In our town, the Asheville Design Center engages in projects that are in the spirit of Rural Studio, I encourage you to keep an eye out for them.